To our friends who routinely purchase electrified fencing supplies from Mytee Products, how do you feel about having to move your fencing in order to accommodate feeding patterns? It’s a big job. We know of quite a few farmers who don’t bother. They build multiple fences around different areas of pasture land so that they don’t have to move anything. The good news for you is that you may someday have access to electrified fencing that automatically adjusts itself. As crazy as it sounds, the idea is currently under development at a farm in Ireland. Two brothers, tired of having to move their fences in step with strip grazing practices, set about inventing a device that automatically moves fencing for them. We promote electrified fencing as an alternative to barbed wire for a lot of reasons, not the least of which is the fact that moving fence is a painstaking job regardless of the fence type you use. Electrified fencing is a lot easier to move. Why? Because there are fewer posts and wires involved. You also do not have to anchor posts as deeply. Even so, it is a lot of work. So the two Irish farmers decided to do something about it. They figured they could come up with something better by combining their electrified fencing with GPS technology and cheap robotic drives. It turns out they were right. The two brothers invented a system that lets them use what they call a ‘hot wire’ extending across an entire run of fence to determine how much grass is available to cattle. The fence is connected to a pair of robotic drives that constantly control the perimeter in response to grazing. This not only solves the problem of having to move fencing, but it also allows the brothers to guarantee that a given patch of grass land is fully consumed before the animals are moved to a new location. For the record, the entire rig sits atop a series of spider wheels that can be controlled remotely. The system runs on rechargeable batteries that can go for up to two full days without being recharged. Its inventors always know the exact location of the fence thanks to on-board GPS. The brothers say it’s going to be several years before their invention is ready for mass market sales. In the meantime, they are just happy to know that it works. And does it ever. Their automatic fence is so impressive that it recently won two awards at a prestigious agricultural show in Ireland. The judges were impressed with the system’s ability to automatically move according to a programmed schedule that calculates the best time for moving. As for the brothers, they say their invention prevents selective grazing and contamination, leads to better use of grasslands, and makes cattle management more efficient. If the brothers eventually succeed in getting their invention to market, it could change the way you buy electrified fencing materials in the future. It will certainly change the way you handle installations. Maybe in addition to purchasing fencing wire and energizers from Mytee Products, you’ll also be buying the robotic drives too. We wouldn’t mind that at all. In the meantime, rest assured that you can continue buying your electrified fencing supplies from Mytee Products. We carry fencing rope, tape, and wire, along with both solar and traditionally powered energizers. Also don’t forget to check out our hay tarps and temporary storage buildings while you’re here. You might find them useful as well. Regular Mytee Products blog readers know that we sell electrified fencing components to farmers, ranchers, and casual animal owners. We believe in electrified fencing as an effective way to keep animals confined without exposing them to barbed wire fencing. In light of that, we want to remind customers to maintain their electrified fencing after installation. As effective and affordable as electrified fencing is, it needs proper care and maintenance to remain in good working order. A failure to maintain, could lead to issues. As residents of Rock County, Wisconsin recently found out. A recent spate of loose animals wreaking havoc on county roads has led to county ordinance changes. Rock County is a fairly rural county in the southern portion of the state. It offers mile after mile of country roads with breathtaking scenery all around. The county is also home to dozens of cattle escapes every year. Local police say the problem is mainly due to inadequate and improperly maintained fences. Unfortunately, allowing cattle to escape puts both them and drivers in danger. Rock County residents have seen an increase in cattle-related accidents over the last three years, some of which have resulted in serious injuries. Many times, the animals have to be put down. Rock County officials hoped to change that when they recently gave police the authority to issue citations for loose cattle. Animal owners can now be fined up to $100 for a first offense and $200 for subsequent offenses. Local leaders hope the citations and fines will be enough to motivate animal owners to maintain their fencing. Whether or not you could be cited should have no bearing on fence maintenance. If you are putting money into fencing wire, energizers, posts, etc., does it not make sense to protect your financial investment by keeping things in good working order? Sure it does. • Broken Wires – Routine inspections will identify broken wires sooner rather than later. It is very easy to remove a section of wire and replace it with a new section. Inspections also identify problems with posts and energizers. • Post Replacement – Electric fence wire does not put nearly the same amount of stress on fence posts as barbed wire. Still, there are times when posts are damaged by the weather or some other external force. A post that is no longer doing its job should be replaced right away. • Grounding – Next to broken wire, the biggest concern with electrified fencing is grounding. If your fence is not grounded properly, no current will run through it, rendering it ineffective. Property owners should routinely check to make sure grounding wires have not been damaged or dislodged. • Solar Energizers – If you are using solar energizers, it pays to check on them every now and again. Solar components do wear out, and you might never know without putting a voltmeter on your fence and measuring energy output. You can also help your cause by making a point of keeping the solar collector surfaces clean. You do not want anything inhibiting sunlight from keeping your energizer charged. Electrified fencing is only as effective as the condition it’s in at any given time. To make sure you get the most out of your investment, put in the time and effort to maintain your fencing. A little bit of routine maintenance goes a long way toward keeping things in shape. Electrified fencing is a safe way to control cattle when installed and used properly. 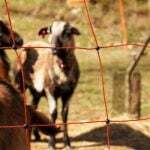 It is a better option than barbed wire if you are the kind of cattle owner who doesn’t like the idea of your animals coming in contact with sharp barbs. Still, electrified fencing should be handled with care, so it better judgement and safety should be used during installation. Much of the safety surrounding electrified fencing and energizers relates to installation. Make sure that you fully understand the fundamentals of electricity and how it operates before you attempt to install fencing in your property. If you are ever in doubt, have a professional do the job for you. With all of that said, here are some important safety tips for electrified fencing. Pay attention to them for your own safety, the safety of your friends and family, and the well-being of your cattle. Electrified fencing is intended to control cattle. It can be harmful to humans, especially children and the elderly. As such, never install electrified fencing in an area that sees considerable foot traffic. Do not install it were children play or seniors walk. Warning signs should be posted at regular increments around the perimeter of the fence to warn anyone who might approach. It is unsafe to install more than one energizer per fence. Don’t do it. If the energizer you have chosen is not adequate for the fence you installed, either separate the fence into two separate fences or buy a larger energizer. Connecting two energizers to the same fence creates a dangerous situation because it interrupts the natural pulse cycle. Whether you are using a battery-operated or plugin energizer, polarity matters. Do not ever reverse it. The red cable on a battery-operated unit should be connected to the positive terminal. The black cable goes to the negative terminal. As for plugin units, the positive terminal has a larger probe than the negative to prevent you from plugging it in the wrong way. Do not ever force a plug into the socket. If it does not plug in easily, make sure you’ve got it in the right direction. There have been some cattle owners who have decided that combining electrified and barbed wire fencing is the best way to control cattle. It is not. Furthermore, it is dangerous. Electrified fencing is designed to create a psychological barrier that controls cattle by giving them an unpleasant zap. A zap or two is harmless. However, repeated pulses over an extended length of time can be dangerous. Combining electrified fencing with barbed wire creates a scenario that could do a lot of damage. If an animal gets entangled in the barbed wire while the energizer is live, it could be subject to continuous pulses that eventually kill it. Stay away from a live fence during a lightning storm. Just to be safe, stay away when you think lightning is approaching. If your general area is prone to lightning strikes, you might even want to unplug your Energizer before the storm hits. Finally, avoid installing electrified fence anywhere near high-voltage lines. The reason is simple: electrified fencing can attract electricity from a high-voltage line, thereby creating a potentially deadly situation. Do not install a fence alongside high-voltage lines or running underneath them. Irrespective of the idea you choose to proceed with, always remember that safety should be your primary concern when it comes to electrified fencing. A slight error in judgement could result in endangering the people and animals in the vicinity.